[unpad.ac.id, 01/10/2019] To improve the community existence regarding the importance of preventing stunting, the academics of Unpad created “Stunting Prevention Gymnastics” with energetic songs and easy-to-follow movements. Since it was created in November 2018, this gymnastics has been widely used and appreciated in a number of activities in several cities and levels of government. The gymnastics was created from collaboration of the Faculty of Medicine and the Faculty of Cultural Sciences of Unpad. Its song lyrics was created by lecturers of the Faculty of Medicine Melani Sari, dr., Sp.A., M.Kes. and Rodman Tarigan, dr., SpA (K) M.Kes., by involving arranger from Bandung. While the gymnastics movement was created by lecturer of the Faculty of Cultural Sciences Taufik Ampera, M. Hum. along with his student Muhamad Nurdin Jamil. Melani said, one of the efforts to increase public awareness can be done through songs. Besides it is interesting, delivering messages through songs can be captured easily by wider audience. 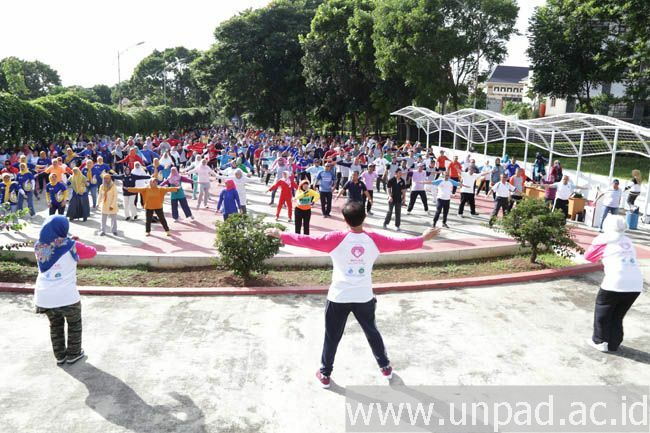 Initially, the gymnastics was created for the activities of the “Academic Health System” held by Unpad in Karawang Regency in early December 2018. But the appreciation turned out to also emerge from the West Java Provincial Government and the Presidential Staff Office by displaying and demonstrating the gymnastics at the event to prevent stunting at the Gasibu Field in Bandung, last November 2018. In addition, this exercise has also been displayed and demonstrated by a number of people in the stunting prevention program in Surabaya and Yogyakarta. “The community is very enthusiastic because the song is very energetic, happy atmosphere, and inspiring,” said Dr. Rodman. In line with Dr. Rodman, Dr. Melani also said that the exercise was able to attract the interest of the community to follow every movement. “Because songs are easily memorized, the notations that are easy listening and their movements are simple, suitable for mass gymnastics,” said Dr. Melani. Meanwhile, as the creator of the movement, Taufik explained that the movement made was not a movement to prevent stunting, but a simple gymnastics movement as a form of campaign program stunting prevention. “We try to make the movements according to the lyrics, rhythms, songs that are there. The movement is a simple and easy to follow, “said Taufik. According to Taufik, “Stunting Prevention Gymnastics” is one proof that various sciences in Unpad can unite to produce innovative works that are expected to benefit the wider community. “The song was made by a medical team, then the movement from FIB (Cultural Sciences), this will also reflect that medical science with cultural science can harmoniously produce an innovative work,” He said. It is expected that this gymnastics can be an educational media about stunting. The public can also be aware of contributing to the prevention of stunting, and are moved to check the growth and development of children so that they can be prevented from stunting. “Stunting can be prevented by family awareness about child development in order to achieve a better generation. All need to care about stunting. Anyone can contribute in preventing stunting either you are teenagers, adult, or parent,” said dr. Melani.